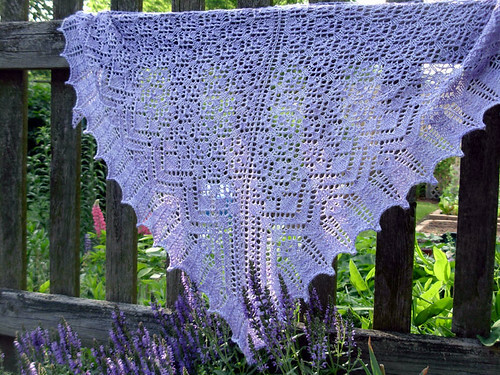 Crocus is a nice shoulder shawl that will serve me well come fall. If the recent weather is any indication (Monday and Tuesday were near unbearable), I won’t need this before then. 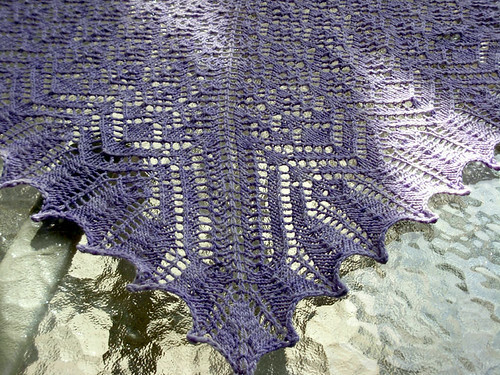 I just loved working with this yarn. It held up to the frogging, and has a very nice “spring” to it that makes it easy to work with. I’ve learned the hard way that I can’t knit with 100% merino unless it is “superwash,” as I have a knack for felting it while knitting, but this bamboo-merino blend worked beautifully. It also blocked very nicely–going from 42″ wide x 17-3/4″ tall to 59-1/2″ wide by 29″ tall finished. Which is bigger than the patten states, so yeah, I still didn’t get gauge on the redo–but that worked out fine. The only question now, is what to turn to next? 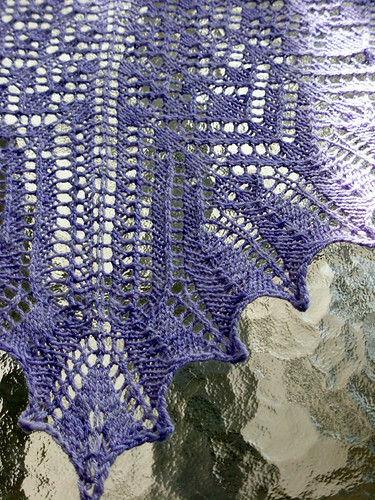 Something completely new now that I’ve finished two projects without starting any new? 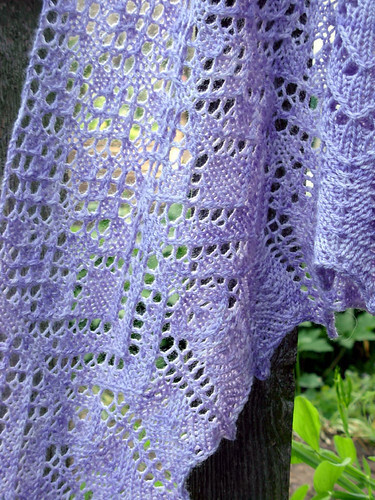 Or perhaps a return to the long neglected Lerwick, which at least has the advantage of being very lightweight and suitable for summer knitting? A visit to the knitting basket is in order! *Edited 6.4.11 when I realized I had the wrong needle size indicated. 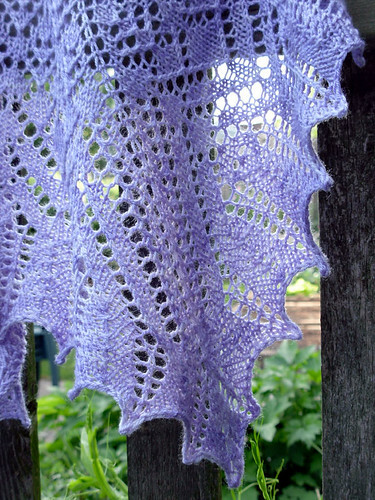 More Yarn – Will Knitting Follow??? It turned out simply fabulous!! You take such gorgeous pictures too! That one with the Lavender in it is my favorite. She’s beautiful! I love that color, and the geometry of the pattern. Makes me hungry for lace!